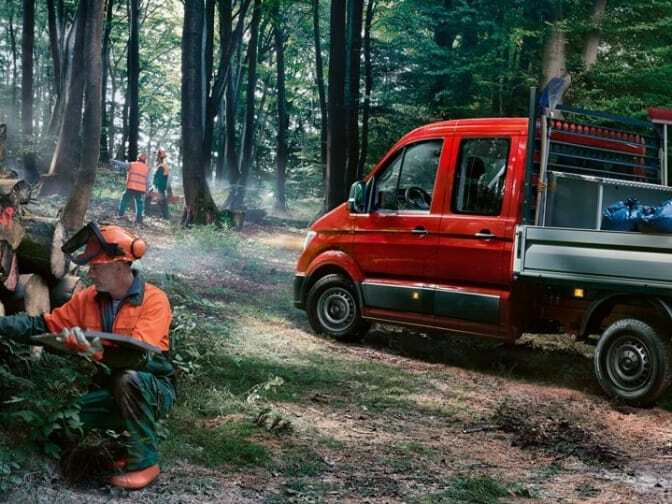 The five different seat options for the driver and passengers in the Crafter Dropside provide tailor-made comfort. Starting with the basic seat with backrest and length adjustment, the comfort seat adds height and seat-depth adjustment, an armrest (on the inner side) and 2-way lumbar support. The comfort seat “Plus” expands these features to include a second armrest and 4-way lumbar support (electrical). The ergoComfort suspension seat and ergoActive suspension seat with heater and massage function complete the lineup. The Crafter Dropside has a place for everything you could need on the job. You get secure storage for everything from files and folders to coffee cups and rulers. You can even charge your laptop and power tool batteries with the optional 230v plug in the cab. Whatever the job is, we'll help you stay on top of it. Full to the brim with technology, the Crafter Dropside helps you stay connected on the road. Get where you need to go easily, directly and with your favourite music. The optional Discover Media navigation system gives you all the directions and soundtracks you need on the job. Combine it with the optional multi-function steering wheel and you can change your music or destination without taking your eyes off the road. Experience even more infotainment on the road and integrate your smartphone into your vehicle with the USB port and Car-Net App-Connect. Car-Net App-Connect mirrors compatible apps from your smartphone onto the optional radio or navigation system's touchscreen display. So you can use Android Auto™, Apple CarPlay™ or MirrorLink™ to conveniently control certain apps via the touchscreen. In addition to this, the Car-Net Security & Service package is now available exclusively for the Crafter. From finding where you parked your van to generating vehicle health reports, Car-Net Security & Service makes using the Crafter day-to-day safer, easier and more practical and economical with features such as geo-fencing and parking location. The Crafter Dropside's innovative driver assistance and intelligent safety systems anticipate difficult situations and help you manage them. Our award-winning safety technology doesn't just reduce risks on the road - it could save you expenses and downtime too. 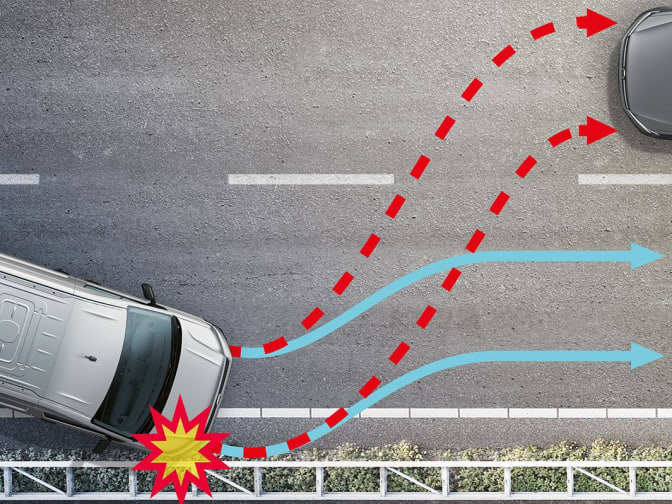 The City Emergency Braking reduces the chance of a collision by triggering emergency braking when it detects critical distances. It also has Anti-lock braking system, preventing the wheels from locking and maintains manoeuvrability. 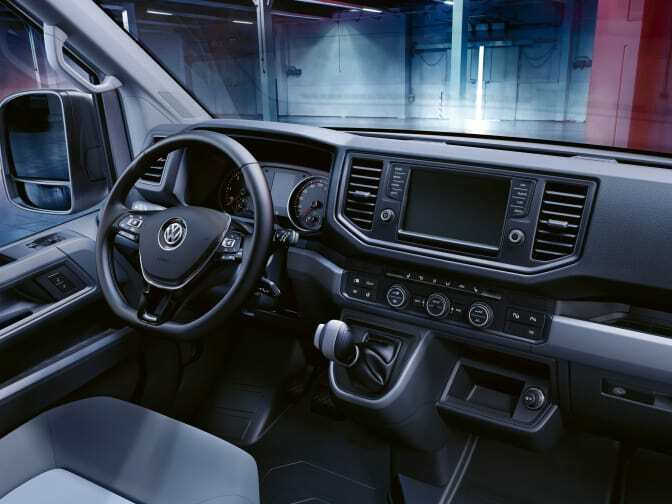 It features Lane Assist, the optional lane departure warning system counter-steers if the vehicle begins to leave its lane unintentionally, while simultaneously alerting the driver with a warning sound and notification on the multifunction display. “Light Assist”, the optional high-beam assistant automatically dips the headlights for oncoming vehicles or vehicles travelling ahead before they’re dazzled. When activated, the system automatically switches on the high-beam headlights when the vehicle is travelling above 37mph in complete darkness. It also has the optional extras of Hill Descent Assist and Driver Alert System.